English: Abraham Lincoln (1809–1865) was the 16th president of the United States from 1861 until 1865. Deutsch: Abraham Lincoln (* 12. Februar 1809 bei Hodgenville, Hardin County Kentucky; † [ermordet] 15. April 1865 in Washington (D.C.)) wurde 1860 zum 16. Präsidenten der Vereinigten Staaten von Amerika gewählt und 1864 wiedergewählt. 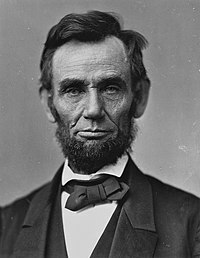 Italiano: Abraham Lincoln (1809–1865) è stato presidente degli Stati Uniti d'America dal 1861 al 1865. Svenska: Abraham Lincoln (1809-1865) var den sextonde amerikanska presidenten. Daguerreotype of Congressman Abraham Lincoln, taken in 1846 by Nicholas H. Shepherd. Abraham Lincoln taken February 27, 1860 in New York City by Mathew Brady, the day of his famous Cooper Union speech. Taken by Alexander Hessler in Springfield, IL on June 3, 1860, Two weeks after Lincoln's nomination. Another view of President Lincoln, Major Pinkerton, and General McClernand, near Antietam, October 3, 1862. Photo By Gardner. On the lower left-hand side of the photo is a man holding a sign marked "7479." He was one of Gardner’s assistants helping to identify the photograph after it was developed. "First Reading of the Emancipation Proclamation of President Lincoln" by Francis Carpenter. Shown from left to right are Edwin Stanton, secretary of war; Salmon Chase, treasury secretary; Lincoln; Gideon Welles, secretary of the navy; Caleb Smith, interior secretary; William Seward, secretary of state; Montgomery Blair, postmaster general; and Edward Bates, attorney general. A rare Standing Photograph of Lincoln taken on April 17, 1863 by Thomas Le Mere at Mathew Brady's studio in Washington, DC. Engraving of President Lincoln based on a photograph taken by Matthew Brady on January 4, 1864. Abraham Lincoln seated in the chair he had sat in during his tenure in the House of Representatives. Taken by Brady on February 9, 1864, Robert Todd Lincoln called it "The best likeness of my Father". Daguerrotype of a Photograph of Abraham Lincoln, used for the $5 Bill. Original taken on February 9, 1864. The Copy Daguerreotype was made sometime later. A photo of Lincoln from his last formal sitting, Taken at Alexander Gardner's Studio on February 5, 1865. The "Broken Glass Portrait". One of the last photographs of Abraham Lincoln taken on February 5, 1865 in Alexander Gardner's Studio. While the plate was being developed a crack appeared on the top, and only a single print was made before the glass plate cracked completely. Last known photograph of Lincoln while he was alive, taken by Henry F. Warren on the White House balcony, March 6, 1865. Lincoln agreed to sit for this photo at his son Tad's request. Thumbnail of the White House portrait zoomed in. The assassination. From left to right are: Henry Rathbone, Clara Harris, Mary Todd Lincoln, Abraham Lincoln, and John Wilkes Booth. Ford's Theatre where Lincoln was assassinated during a play called Our American Cousin and died at 7:22:10 A.M. The theatre still stands today on NW 10th Street in Washington, D.C..
Lincoln was prepared for his burial in Springfield, Illinois. On the penny in 1990. On the penny in 2005. On the first 100 dollar bill. On the first $5 bill. On the dollar bill in 1963. Deze pagina is voor het laatst bewerkt op 5 jan 2019 om 09:55.